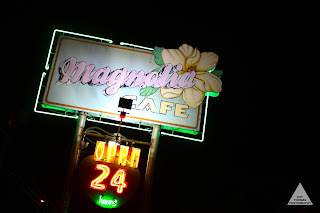 As Silverlakey as you can get outside of LA the Magnolia Café is open all night (great for performers finishing their night at one in the morning when most of the time we’re at a pizza joint or Denny’s because it’s the only thing open..) and serves fresh food cooked with passion in a comfortable setting (kind of like your favorite aunt’s giant kitchen, if she had one). And with their tagline of “Everybody knows, everybody goes,” you know it’s an Austin institution. While there I had to get some Chips & Queso & Salsa ($7.25). I’m not a lover of this dish (I swing towards the Guacamole side of the Chips and Dish spectrum) but after subjecting to myself to the three hour film known as Boyhood (really Richard Linklater you could have cut an hour; none of us would have noticed…) I felt it was my duty to the city of weird to order up. And Hello!!! The corn tortilla chips were fantastic! Crunchy, bright golden yellow, and salted to perfection (a pet peeve of mine is when house made chips don’t include the necessary amount of Sodium Chloride to balance the dish out properly…). 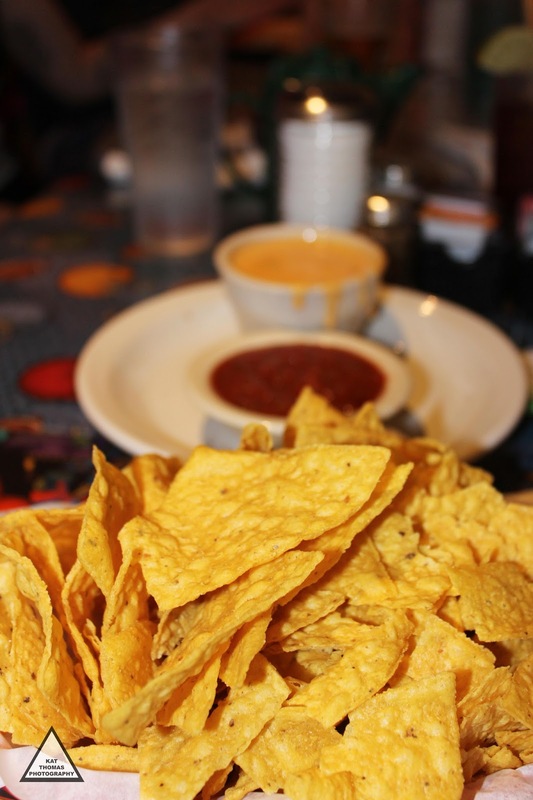 The Queso was the proper balance of creaminess peppered with chunks of salsa to add the subtle hint of flavor and texture! 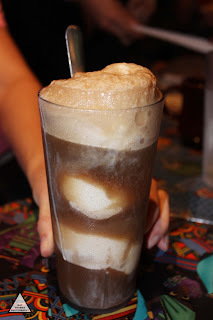 To balance this saltiness out accurately I was required to share an A&W Root Beer Float (Hey, it was 1 in the morning...). It was the unmarred pairing; creamy ice cream and sarcastically biting root beer! 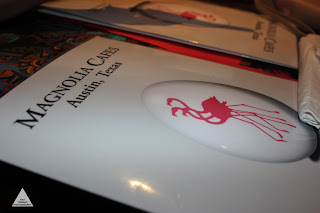 Emerging later that night I had experienced Austin; confirming its weirdness and Dinners, Drive-Ins, and Dives eatery level accomplishments. 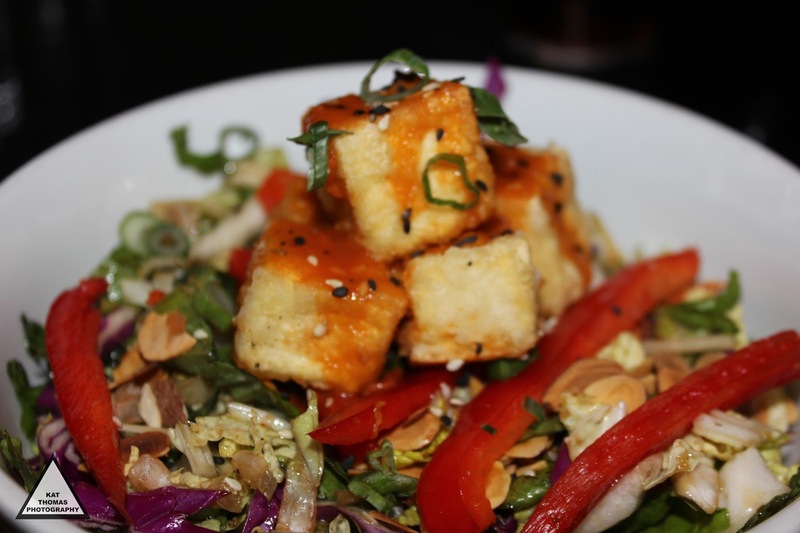 Here’s to life being delicious and there being enough Sodium Chloride on all your tortilla chips! Hello Bright Shiny Lights!!! 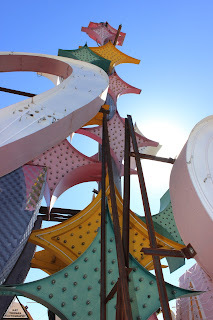 A couple of weeks ago Edible Skinny was Lady Luck-y enough to visit The Neon Museum in Las Vegas. 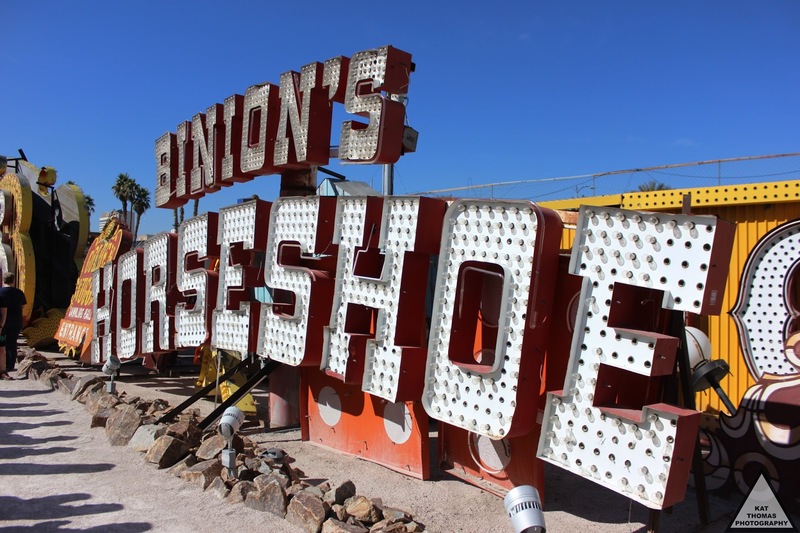 Founded in 1996, the Neon Museum is a non-profit 501 (c) 3 organization dedicated to collecting, preserving (pigeons poop is a real problem for these signs…), studying, and exhibiting iconic Las Vegas signs for education, historic, arts, and cultural enrichment. 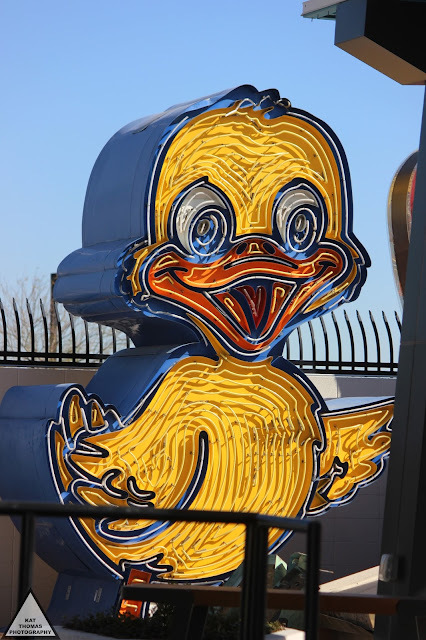 The Neon Museum’s 2 acre campus includes the outdoor exhibition space known as the Neon Boneyard which houses more than 200 historic signs, a visitors’ center housed inside the former La Concha Motel lobby, and the Neon Boneyard North Gallery which houses 60 additional rescued pieces including signs from the Palms Casino Resort, New-New York, Lady Luck, and O’Shea’s, and which is also available for weddings, special events, photo shoots, and educational programs. Most of The Neon Museum’s signs are exhibited in the Boneyard where they serve as inspiration to fascinated artists, students, historians, designers, and roaming food and travel bloggers. 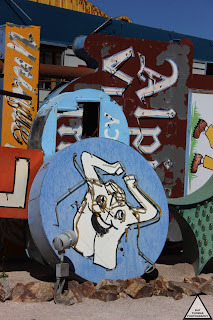 Each sign at the Neon Museum’s collection offers a unique story about the personalities who created it, what inspired it, where and when it was made, and the role it played in Vegas’ distinctive colored past. On the tour changes and trends in design and technology are illustrated in the pieces that range from the 1930s to the present day. The Boneyard is home to some of the most treasured world-famous signs of Las Vegas: Caesars Palace, Binion’s Horseshoe, the Moulin Rouge Hotel, the Golden Nugget, and the Stardust. My absolute favorite is a happy-go-lucky dry cleaning shirt sign from the 1960s that just looks so happy it could make even the roughest of Vegas nights seem a little brighter!!! Not just neon signage, the museum also houses fiberglass sculptures including a giant skull from Treasure Island. 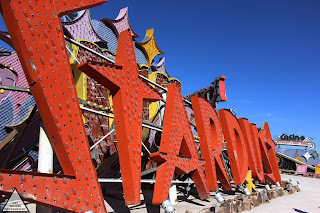 Due to the nature of their collection, the Neon Museum Boneyard is only available to the public through an hour long guided tour (older neon signs are made out some rather nasty materials that can be harmful to the unsupervised…). Ticket prices for day tours are $18 for general admission; seniors 65+, students, active military, veterans and Nevada residents are $12. Most of The Neon Museum tours are before sunset, but the non-profit does also offer dusk tours of their seven beautifully restored neon signs that light up the Vegas sky in their full glory; pricing for evening tours is $25. 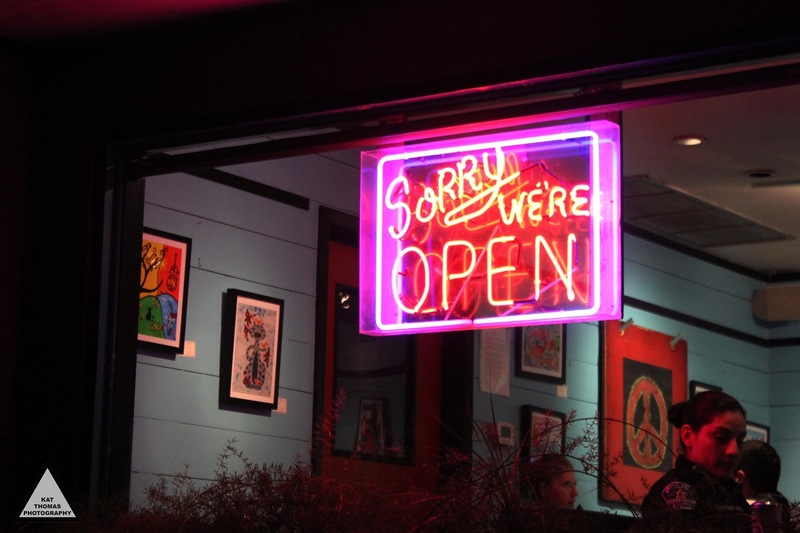 The Neon Museum also maintains twelve restored signs throughout Las Vegas. 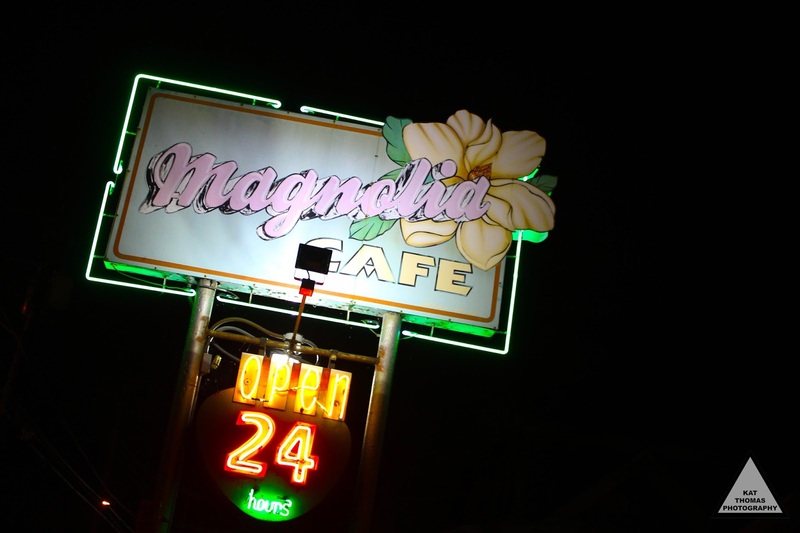 Some reside on street medians such as the Silver Slipper to honor Vegas’s glittery past. So if you’re in the city of Sin and looking for a gander into the world of the bright shiny neon lights of Las Vegas perhaps a trip to The Neon Museum is in order. Here’s to life being delicious and to every day having a happy-go-lucky dry cleaning shirt sign! Last month I was in Portland for Workin’ The Tease’s #StripForPP Fundraiser for Planned Parenthood Columbia Willamette. 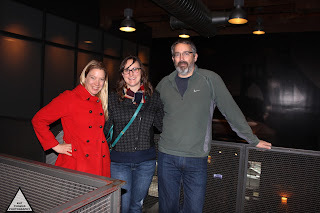 And while there I was able to grab a quick lunch with family at BridgePort Brewing Company’s brew pub. With a warm modern design in the heart of the Pearl district of Portland, Bridgeport Brewing Company is Oregon’s oldest in operation craft brewery. 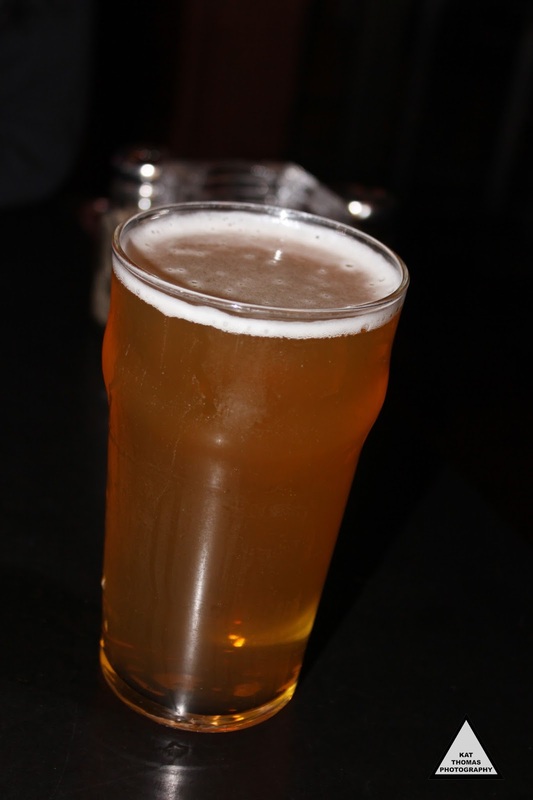 With classic brews such as Black Strap Stout, Summer Squeeze, Ebenezer Ale, and Pintail Ale the company has evolved from microbrewery to regional leader in the specialty brewing market. 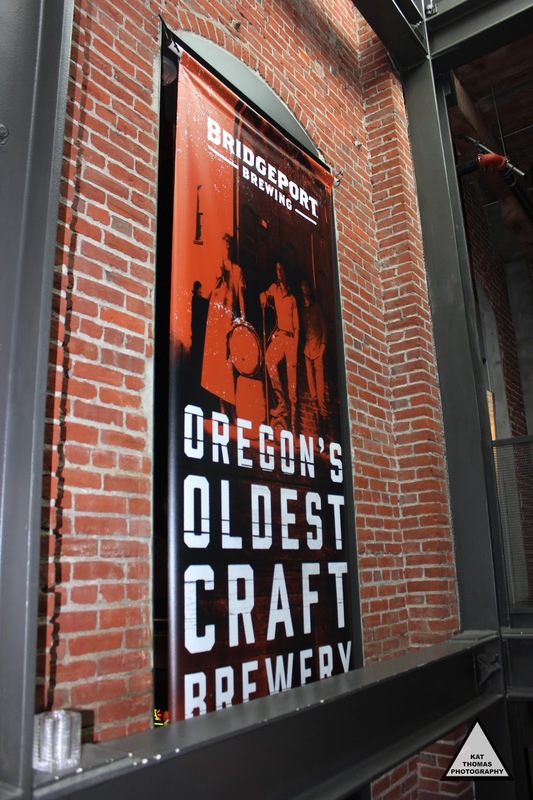 BridgePort Brewing Company’s commitment to high quality craft products also transfers to their character driven food that served at their Marshall Street location. 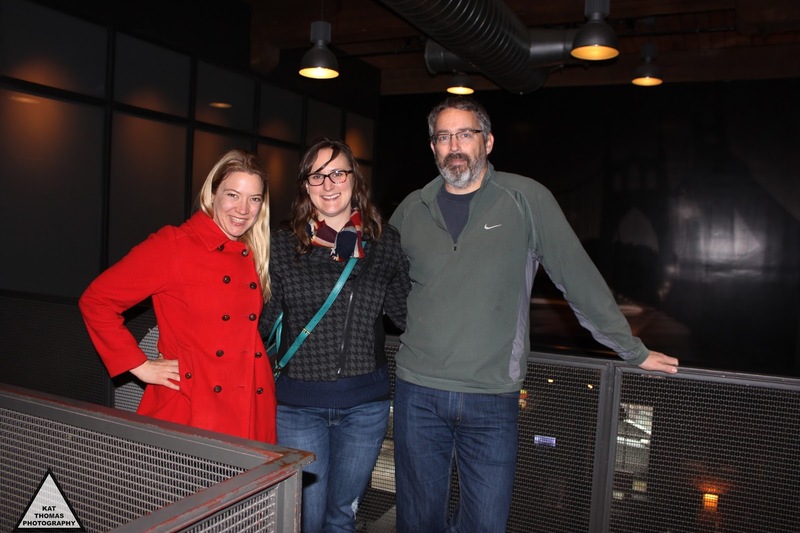 With a menu claiming, “We make food the same way we make beer. 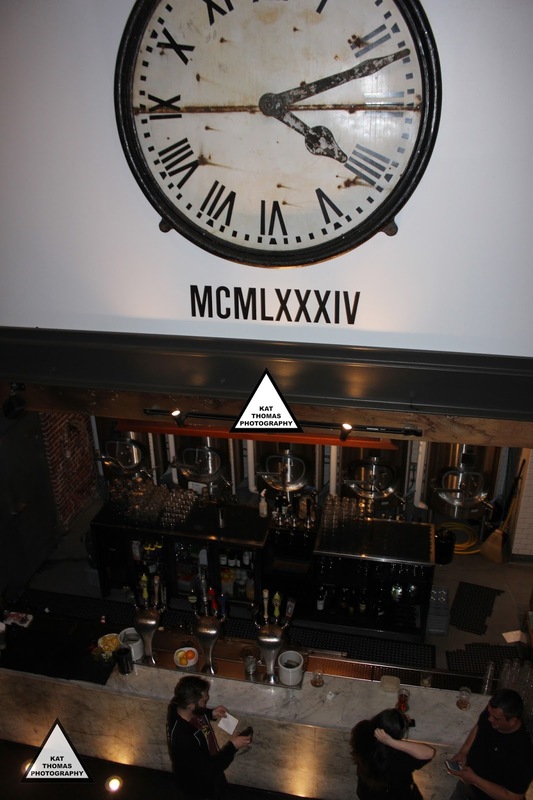 It’s well-crafted, it’s full of character, and it rewards people for having good taste,” I was excited to experience food and beer perfectly complimenting each other. After ordering from the absolute doll of our server, I dove into their Vegan Bowl ($12) consisting of superfoods such as Organic Quinoa, Black Beans, Grilled OTA Tofu (a Portland based Tofu company), Kale, Sweet Potato, Edamame, Red Peppers, and Green Onions topped with Season Carrot Salad and Spicy Cashew Sauce. The dish was Tres Yummm!!! Pacific Northwest healthy while being hearty enough to compliment the beer I was imbibing. Oh and about that brew, while there I sampled their classic Old Knucklehead a barley wine style ale that is aged with oak. The ruby-colored brew kicks off with malty sweetness, finishing off with notes of vanilla, toffee, and cherry. The result was the perfect Brew for people who don’t like beer (Read: Me), a big taste experience. So if you’re in the Pearl Street area of Portland and are looking for a great place for both brew and bites, check out the delightful BridgePort Brewing Company! Here’s to ruby colored beers for people who don’t like beer and life being delicious!! !